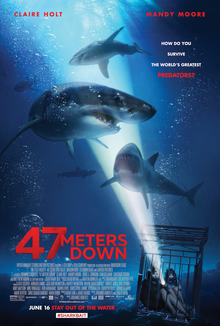 You’ll never get a more straightforward title: 47 Meters Down. What could this possibly be about? Claire Holt and Mandy Moore portray sisters who are on vacation in Mexico. One of them is moving on from a recent, difficult breakup. And they go on a deep sea diving expedition and swim around with the fishies in a cage. Unfortunately, things go south…Guess you could say. The winch that’s holding their cage malfunctions and down down down they go, where they stop, nobody knows. Well, we do know. It’s 47 Meters…you know the rest. 47 Meters Down was a surprise box office hit. The film, a 2017 British flick directed by Johannes Roberts, written by Roberts and Ernest Riera, grossed a whopping 61.7 million. Originally slated as a VOD release, Entertainment Studios committed to a wide theatrical release. And a savvy business move that was. So, where does this rank with respect to shark attack movies? It’s more survivalist flick than shark attack, but look at the poster. They know how their bread is buttered. Join us on the Really Awful Movies Podcast as we dive into what’s good, and what’s not so good about 47 Meters Down. Interested in animal attack movies? 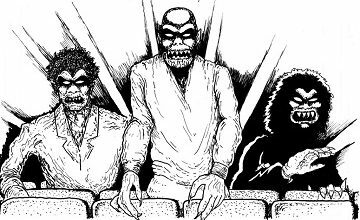 We delved into Grizzly on an earlier episode, and also, Kingdom of the Spiders with Scott Drebit (Daily Dead).